Boochie has now topped our list for the best backyard game for kids list! If your kids are a fan of Bocce Ball then they are going to be blown away with Boochie. We had ordered this for a friend’s little girls birthday and was the hit of her party. Like Bocce Ball but has many awesome new rules and plays that ensure no game is ever the same. The point of the game is to throw both a ball and a ring to the closest to your target. After each point you turn the dial on your wristband that gives you a unique rule. This may include throwing between your legs or even with your eyes closed. 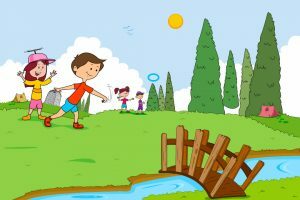 Featured in our Best Outdoor Games for Kids list, this backyard game is so much fun we had to provide you with a Boochie Outdoor Kids Game Review. This will be a game your family can be playing it all summer! 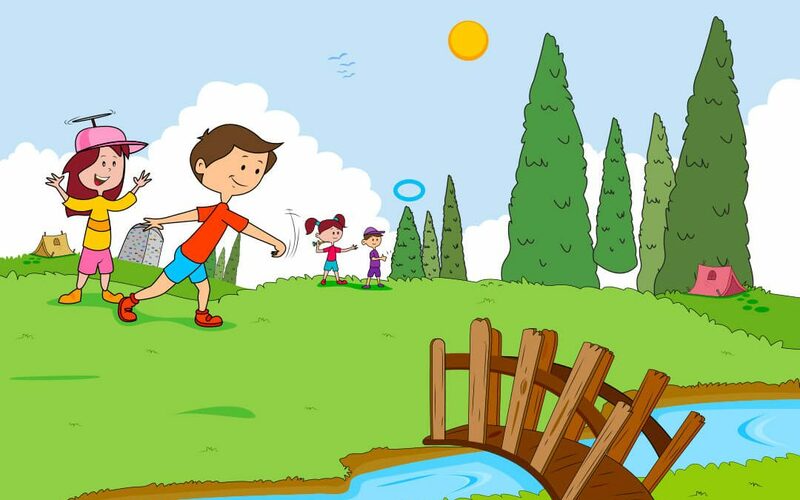 The goal in Boochie Outdoor Kids Game is to get as many points as possible by throwing your ball and ring the closet to the target. The first person to get 11 points or more wins. But there are more twists to this game than traditional Bocce rules, keep reading. Boochie is played ideally with 2 to 4 people. Option: you can play with up to 8 people, 2 people per team, and each team rotates team member who throws each round. To setup you first need to give each player their own bean bag, toss ring, and wrist tracker. There are 4 different colours to choose some so make sure that all the equipment above are the same color for each player. Wear the wristbands on the non-throwing wrist so it does not get in the way. Once you have handed out your equipment, decide who gets to the throw the Boochie Ball first. 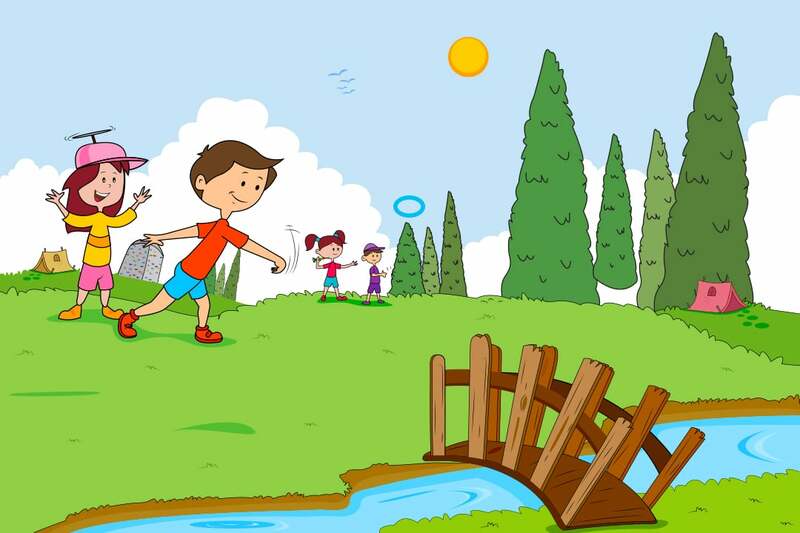 The “official” Boochie Outdoor Kids Game rules to decide, is that the person with the cleanest shoes throws first. Sometimes that is a hard decision, make sure to keep those shoes tidy! Especially for the Backyard Games where shoes are normally not an option! If you are barefeet, go with the cleanest feet. Once you have decided who throws first, that person throws the 12 sides target ball approximately 12 feet away. Establish an invisible throwing line where this was tossed and take turns throwing an object (either hoop or ball) and rotate threw players. Once all the objects have been throwing walk up to the target and get ready to count your points. We will go over scoring in the next section. For each point you get you will advance your wrist tracker by that same amount. There are many ways to score points in Boochie. Guaranteeing that each game you play will never be the same! Closets Balls – The first points are scored for the closets objects to the Boochie. The player with the closet object to the Boochie gets 2 Points, and second closets gets 1. If both objects are the closet you may earn 3 points for this. Bonus Points – If your ring lands around another players ball you get and additional + 1 points. If your ring lands around the Boochie you get an additional + 3 points. Featured points – Look down at the 12-sided Boochie Ball and see what rules are printed on the top side. The Boochie ball features 12 rules for each side of the ball that applies to each round. Add the featured points for what it said. For example, one of the balls says + 2 points for the furthest ball away or other featured points. After the balls have all been thrown and your points have been scored now you can pick up your equipment. The person who got the most points in the round gets to throw first. Before they throw you will need to move your wristband ahead the for the number points you got. On your wristband it will have a new challenge that you will need to work with. Some of these challenges on the wristband may include throwing with your eyes closed, tossing between your legs, and so much more! Use that new challenge in your throwing technique for the next round until you score points to advance your wrist tracker to a new challenge. After the round do the same instructions as before when picking up your pieces and the person who scored the most points throws first. There are 2 ways to win the Boochie Game. The first is to be the first to get 11 or more. The second way is if you are fortunate to land your ring around the Boochie Ball when the side at the top says, “instant win”. If you do so you will automatically win! In the case of a tie if you both get land on the same 11 or more number then you will need to reset the wristbands for all and start all over from zero. Game description: Boochie is like Bocce, but for kids. And better! Ad an interactive challenge to this game with rules that change each turn to keep everyone ENGAGED.